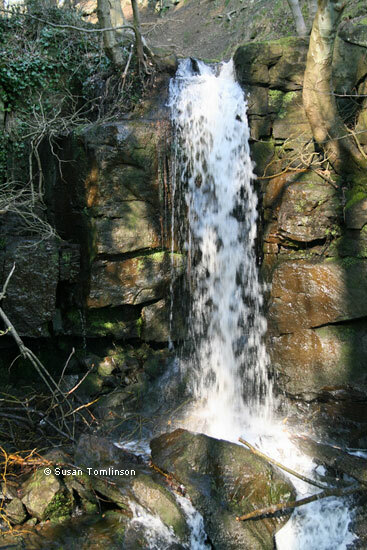 The building next to the waterfall on the Bentley Brook at the top of the image (above) was a grinding mill, used for grinding both corn and minerals and dating from the 1770s and powered by the fast flowing water of the brook. Part of this building still exists today. Other very old mills in Lumsdale were a bone mill (probably originally used in the 17th century for lead smelting), a paint mill that could date from the 1600s and an upper and a lower bleach works. There was also a saw mill, built around 1850, and originally used for grinding paint. 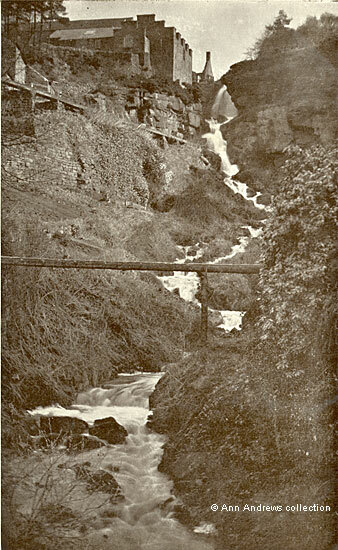 In 1780 Lumb's Mill was included in the inclosure of common land; the Lords of the Manor of Matlock were to have "one twenty-second part of the whole, also the Lumb's Mill, with all the buildings, weirs, goits, and appurtenances, and six acres on which to get stone to repair the buildings, for rebuilding or repairing the houses, bridges, walls, fences and other works" . A few years later several advertisements were placed in the Derby Mercury advertising the leases of the lead smelting mills that then existed in the valley. 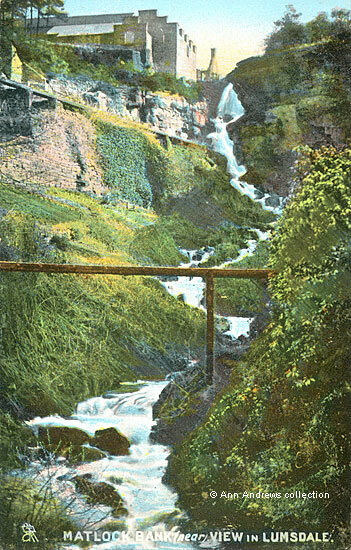 In more than one instance the advertisements suggested a change of use for the buildings, indicating that this was when the smelting of lead ceased to be an industry in Lumsdale. Transcripts of two of the advertisements are included here. The Remainder of a LEASE of a powerful WATER MILL, Twelve Years of which is to come, (renewable at Pleasure,) situate at Lums near Matlock, in the County of Derby, in a very populous Neighbourhood, heretofore used as a Smelting Mill, but may be converted into a Worsted or Cotton Mill. It will be sold separate or together, with two excellent Cylindrical Bellows, a set of Stampers, and other material thereto belonging, all used for the purpose of Dressing and Smelting Lead Slag, but powerful enough to Smelt Iron or other metalic Matters, being all in excellent condition for the purpose. Further Particulars may be had by applying to MATTHEW SANDERSON, Chymist and Perfumer, Hanging Ditch, Manchester. Attendance will also be given at Mr. FLETCHER's, Queens Head, Matlock Bridge, on Wednesday the Twenty-first of July next. and saying the building and its "powerful water wheel" were "almost new". The Mill had been used as a Slug Mill, capable of turning out six times the quantity of Lead Slagg or Lead Ore. The remaining term of Twenty Years, of the lease granted by the Trustees of Bonsall School, of all those Premises situate upon the Lumbs Brook, near Matlock, and called the Lower Lumbs Mills; consisting of Cupola and Slagg Mill, with Furnace, Bellows, and Water Wheel ; with necessary Conveniences, all in good Repair, and fit for immediate Work : There are two small Houses close to the Work fit for Workmen. - The whole are subject to the payment of Five Pounds yearly. Enquire of Mr. ADAM SIMPSON; who wants to sell the Security for Two Hundred Pounds, on Cromford Bridge and Langley Mill Turnpike. The Lower Lumbs Mill had been built in 1770. It was also used for grinding corn. John Garton's bleaching house at Lumsdale was considered by Stephen Glover to be "one of the most eminent bleaching houses and grounds" in the county in 1827. The Lumsdale Bleaching and Dyeing Mills were established in 1794 and were originally owned by Messrs. Watts Lowe & Co. and used for cotton spinning. Their business was unsuccessful, and John Garton changed its use. By 1903, when Benjamin Bryan wrote his "History of Matlock", there were still two corn mills in the parish, owned by a later Mr. Garton and tenanted by E. H. Bailey. 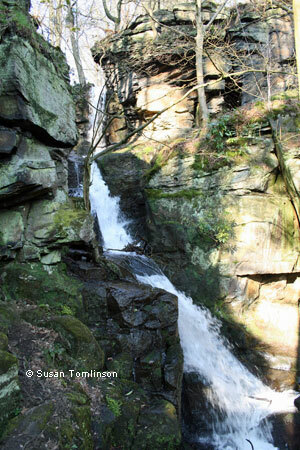 The upper mill was on the Bentley Brook and was "fitted with the latest machinery, stones, and appliances". Matlock. Lumsdale. This is a charming view of part of Matlock, situated steeply upon the right bank of the river which here has flung itself into a waterfall. The opposite bank is a limestone mass out of which yew and fir and ivy grow almost at the water's edge. A Derbyshire Times journalist who strolled through Lumsdale in the spring of 1902 said the banks of "the pretty stream will later be covered with rhododendrons". He visited the bleaching works, then leased to Messrs Farnsworth Bros., and was shown round. "The pure whiteness of the skeins of thread and cotton after they had been submitted to the orthodox treatment was wonderful -- I saw the tanks of chemicals for bleaching and then the machinery where pure water takes away all trace of the chemicals and leaves the material soft an snow white in appearance". Such industries have long disappeared from Lumsdale. The last to close was Drabble's Mill (Tansley Wood Mill) in the 1990s. It had been in the family's hands for around 110 years, the first Drabble being Frederick Henry and the last his great grandson. They had owned it for almost ninety years. the section of the Bentley Brook shown in the postcards as it is today. 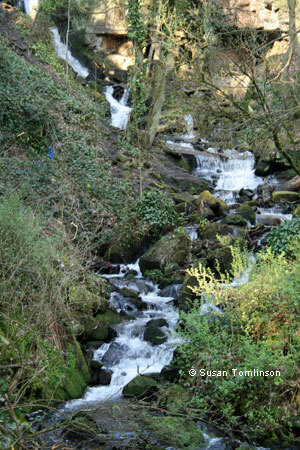 Sections of the brook below the mill and the waterfall. This is the closest photograph to the view shown on the two post cards. The remains of the grinding mill can be seen through the trees top left. The metal rails, bottom left, are part of a viewing platform. drawn up to deal with this problem and conserve the buildings. 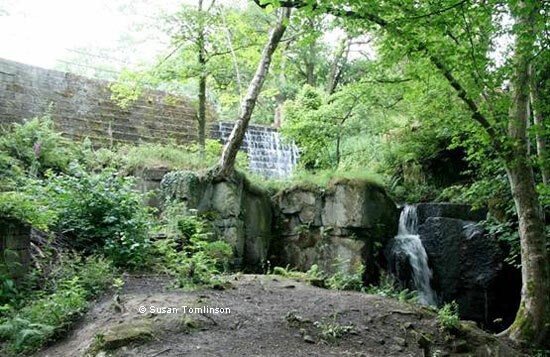 shows the dam of the 3rd pond which was created in the 1850s from a disused quarry. 1. "Matlock Bank (near). View in Lumsdale". Published by Raphael Tuck & Sons, Art Publishers to their Majesties the King and Queen, "Chromette" No.4919. Posted 6 Dec 1905 at Matlock Bridge. Personal message not relevant to picture. 2. "Matlock Bank. View in Lumsdale". Published by Raphael Tuck & Sons, Art Publishers to their Majesties the King and Queen, "Glosso" Series 5529. Not posted. Leaflet published by the Arkwright Society, about 1987. With thanks to Susan Tomlinson. Glover's "History of Derbyshire", vol.1. "Directory of the County of Derby". Accurately taken during the years 1827, '8, and '9, by Stephen Glover Derby: Printed for the Publisher by Henry Mozley and Son, Sold in London by Longman & Co. (introduction). John Garton's name was also published in the Matlock section of this directory, as well as in later directories. 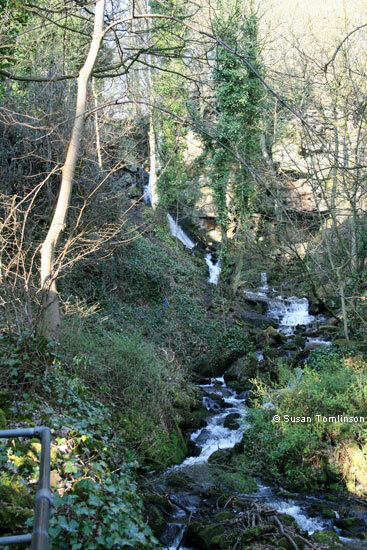 He had been living and working in Lumsdale since at least 1820, when one of his children was buried at St. Giles. By the time of the 1901 census a descendant, Edward H Garton, was in Lumsdale. "Derbyshire Times", 26 April 1902.